Darke County will receive $650,000 from the state for new voting machines. Elections Director Luke Burton, however, worries it may not be enough to replace the current model (shown), many of which have been repaired with tape and glue. 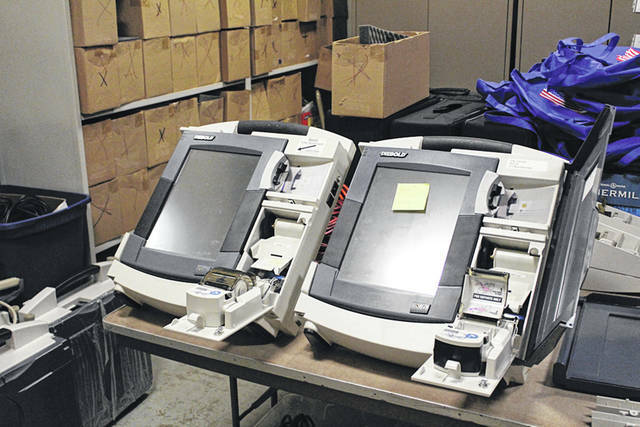 DARKE COUNTY — If all goes as planned, Darke County voters may see new voting machines in the May 2019 primary. On Thursday, Ohio Secretary of State Jon Husted notified county boards of elections they may begin the process of acquiring new voting equipment through the Voting Equipment Acquisition Program. A total of $104.5 million in funding will be available to purchase new equipment for counties. The Ohio Department of Administrative Services has awarded contracts to five voting system vendors — Clear Ballot Group, Dominion Voting Systems, Election Systems & Software, Hart InterCivic and Unisyn Voting Solutions. Eligible county boards of elections will select their system, equipment and services from the approved vendor’s list. The Secretary of State’s Office has encouraged county boards to work closely with their county commissioners in choosing a voting system. The funding will be released in phases, beginning with approximately $72 million available to counties who plan to replace their voting systems prior to the 2019 Primary Election. In addition to the $104.5 million in replacement funds, $10 million in reimbursement funding will be available to counties who have replaced their voting systems since Jan. 1, 2014. Darke County Board of Elections Director Luke Burton said the Secretary of State’s Office informed him the county will receive $650,222.36 toward new voting equipment. However, Burton said the county’s options would be limited, and he will request new quotes from vendors. “The board and I have had several conversations with the Darke County Commissioners about this. The county will not be able to provide funding above what the state has allocated to us. $650,000 is a lot of money, but initial quotes for a couple of the vendors were well above this,” he said. In December 2017, Burton told The Daily Advocate the county’s current voting machine, the Diebold TSX, has been in service for 12 years. He said approximately a quarter of the county’s 240 voting machines have undergone repairs or are no longer operable, some repaired using duct tape and super glue. Burton hopes that while the board would be able to fund new voting equipment “100 percent without county help,” there are ongoing costs that need attention, all amidst a $1 million anticipated shortfall in the 2019 county budget. Burton said the board has not made any decisions or officially eliminated vendors from consideration. However, he said he would be surprised if a decision is made during the board’s December meeting. “We will need to start finishing the decision-making process soon in order to implement the voting equipment in May 2019,” he said. This entry was tagged Boards of elections, commissioners, Darke County, Darke County Board of Elections, Darke County Commissioners, Department of Administrative Services, election, Elections, Ohio Department of Administrative Services, Secretary of State, vote, voter, voters, voting, Voting Equipment Acquisition Program. Bookmark the permalink.